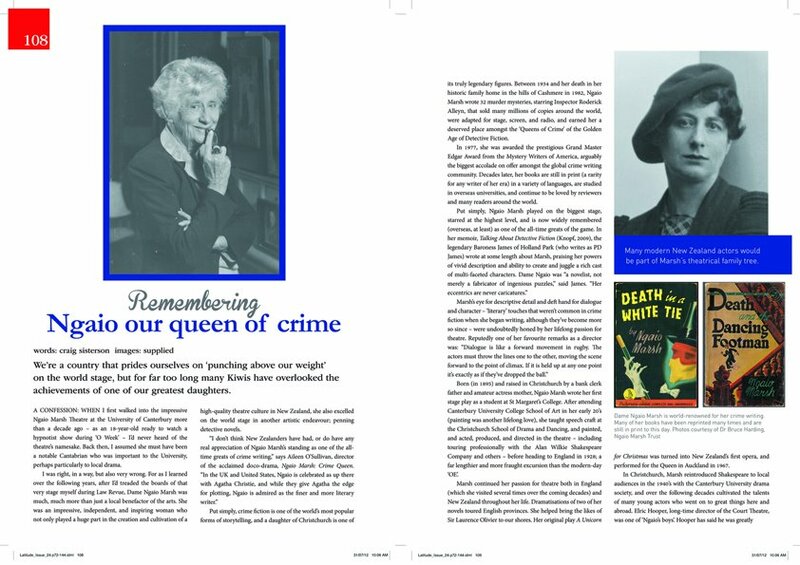 This month's new issue of Latitude, the lifestyle magazine for the Canterbury region in New Zealand, includes a large feature article I wrote on Dame Ngaio Marsh, the doyen of New Zealand crime writing and the namesake of our very own indigenous crime writing award. I am looking forward to seeing the feature myself, as I wrote it quite a while ago, but through the timeframes, lead times, and vagaries of magazine publishing, it is now being published to coincide with the upcoming 2012 Ngaio Marsh Award for Best Crime Novel, which will be presented next month in Christchurch, Dame Ngaio's home town. And it's always great to see what Angela, Jo and the rest of the team have done, in terms of design and layout, to bring my article and those of other contributors, to life within the pages of what is a terrific magazine that is always great to read. Over the years the team at Latitude have been very supportive of local crime writing, featuring it regularly in reviews, and have even included features on authors such as Paul Cleave. If you are in the South Island, you should be able to pick up a copy of Latitude from any good bookstore or newsagent (ask them if you can't find it in the racks). Otherwise, if you'd like to get your hands on a copy of the magazine, email Jo Taylor at joanne@latitudemagazine.co.nz and I'm sure she'll be able to point you in the right direction. 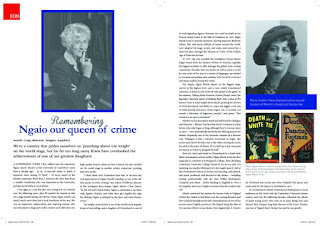 The magazine is definitely worth a read at any time, but this month, with a large feature on our own mysterious Dame, perhaps even more so for the crime fiction fans amongst us.